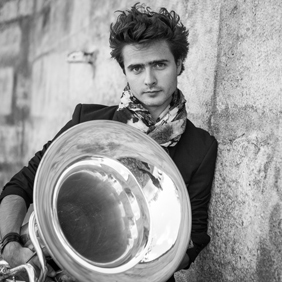 As the winner of the Victoires de la Musique Classique award (the French equivalent of the Grammy Awards) in 2012 at the age of 24, named instrumental soloist “Revelation of the Year”, Thomas Leleu is the first tuba player to obtain this coveted distinction. At only 27, he is already enjoying a remarkable career: known as the young international star of the tuba, his musicality and astonishing deftness make him a unique genius of his instrument. In his hands, the instrument takes on a contemporary shine, revealing an almost infinite range, a delicacy and complexity that have rejuvenated it. With his determination to break down the barriers between classic and contemporary music, his eclecticism and his free, fun approach to concert playing, he is the ideal emissary of his instrument. Born in 1987 in Lille, northern France, he began studying the tuba with his father, before working with François Thuillier and Philippe Legris. At the age of 17, he was admitted to the Paris Conservatoire National Supérieur de Musique et de Danse, where he studied under Gérard Buquet. He graduated with the first prize for tuba playing and obtained his diploma with distinction. In 2006, he furthered his studies at the Hochschule für Musik in Detmold, Germany, under Hans Nickel. A prize winner of the prestigious international competitions of Markneukirchen (Germany), Jeju (South Korea), and Luxembourg, Leleu was selected by competition at the age of 19 as solo tuba player for the Orchestre Philharmonique de l’Opéra de Marseille. Parc, Festival Eurocuivres (all in France), Linz International Brass Festival (Austria), the Trombonanza Festival (Argentina), Festival International de Cuivres de Namur (Belgium) and the Pristina International Festival (Kosovo). Leleu, ardent about the music of his time, has performed the world premieres of works by renowned composers such as Richard Galliano, Vladimir Cosma, Marc Steckar, Jean-Philippe Vansbeselaere, Dominique Probst and Jorge Tagliapietra, and has been accompanied by orchestras that include the Orchestre National d’Ile-de-France, the Philharmonisches Orchester des Theaters Plauen-Zwickau (Germany), the Jeju Symphonic Orchestra (South Korea), the Orchestre d’Avignon, the Orquesta Sinfónica de Lara (Venezuela), Orquesta Sinfónica Provincial de Santa Fe (Argentina) and the Brighouse and Rastrick Band (UK). A charismatic and likeable artist, he is regularly invited to participate in TV programmes on French TV channels (France 2 and France 3), and French radio stations, such as Radio Classique, France Musique and France Inter, as well as the Bayersiche Rundfunk and Radio Nacional Argentina. In 2012, Leleu founded the Thomas Leleu Sextet and became a godfather of the youth development and social change organization El-Sistema-France. He is the Melton Meinl/Weston Artist and ambassador for the Buffet Group of wind instruments. Working with the prestigious German instrument manufacturer, he helped develop the 2250 TL “French Touch” tuba that he now plays.